Salento had been on my list of things to do in Colombia for months before I even left home. I decided to travel Salento after seeing all the stunning imagery of those super tall palm trees. And Colombia’s stunning coffee region did not disappoint. Salento is an absolute must-do on any trip to this part of the world. 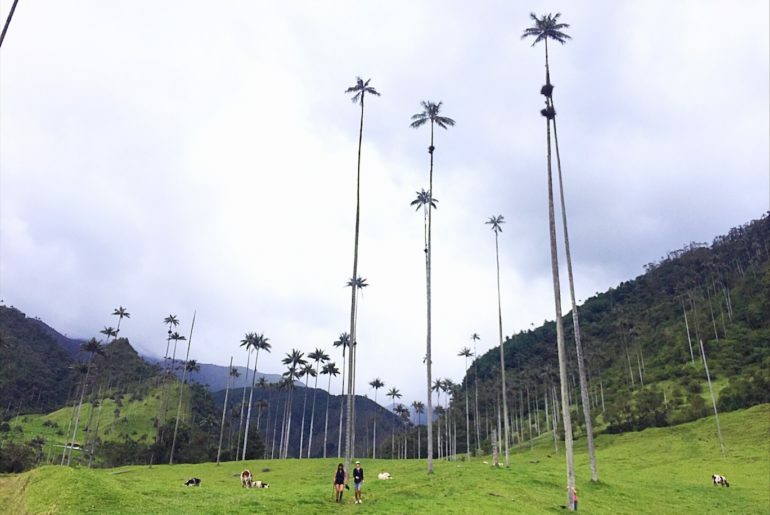 With post-card like views, incredible hikes, even more impressive coffee and the world’s tallest palm trees, here are all the things to do in Salento Colombia before you leave. 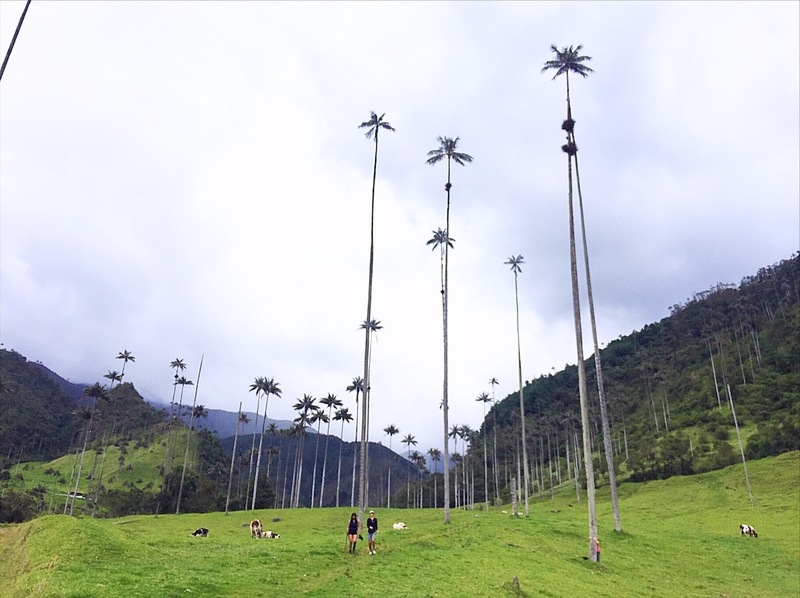 Taking in the world’s biggest palm trees in the Cocora Valley Salento. Hiking here is definitely one of the best things to do near Salento Colombia. 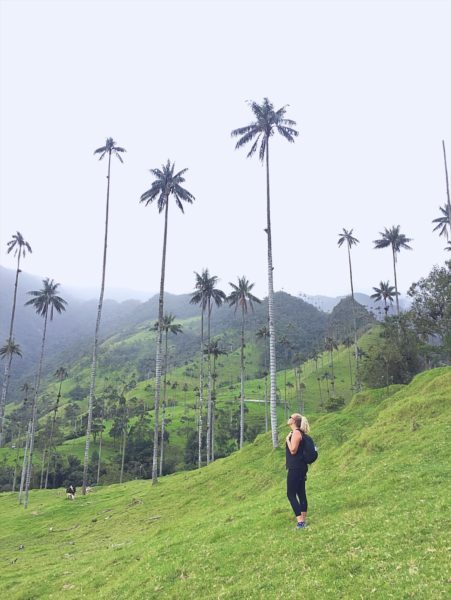 One of the top things to do in Salento Colombia has to be the incredible Salento Cocora Valley (or Valle de Cocora in Spanish). It’s home to the world’s biggest palm trees which tower some 60 meters above your head as you hike through the stunningly green fields. There are two options for the hike to the palm trees. The long version, which takes about 6 hours and takes you through the jungle across rickety rope bridges and all the way up to the top of the valley. Here you can get yourself a snack while watching hummingbirds sip at the sweet water people have put out for them. 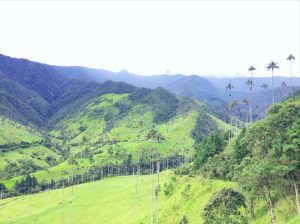 Then you continue on and come down through the Cocora Valley and through the Salento Colombia palm trees. Or, the short version, which takes about 2.5 hours and just takes you up and then back down the valley. 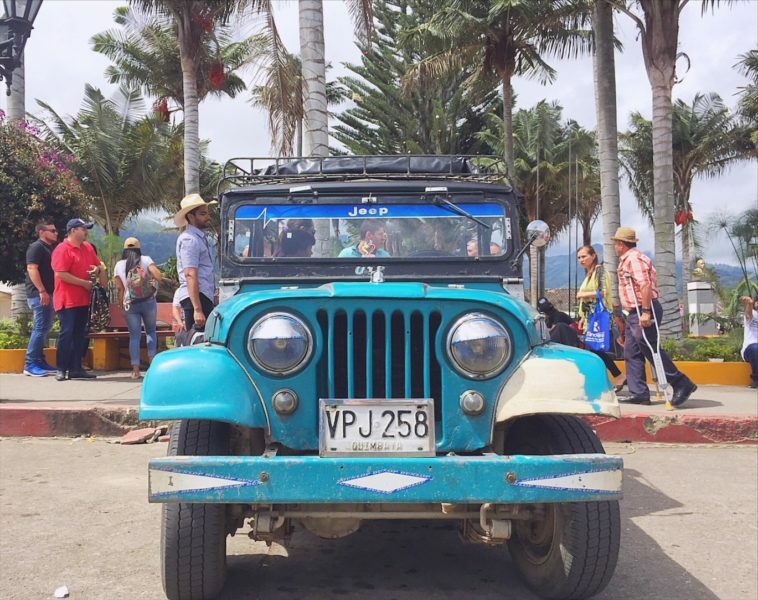 How to Get To The Cocora Valley Salento: From town take a jeep to the Valle de Cócora ($3,800 COP per person). If you want to take the long route walk up the path and go right through the blue gate. If you want to take the short route keep walking up the path. Quick Facts: Cost: $6,000 COP for entry and $7,600 COP for your transport. Total about $4.50 USD. | Time Needed: All day| Verdict: One of the best Salento Colombia activities for sure. Don’t miss! 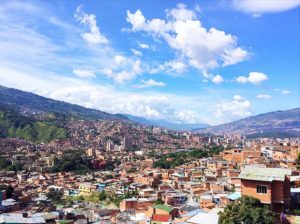 Wondering what to do in Salento Colombia, Colombia’s coffee capital? Well, sip coffee of course! Jesus Martin is a cute little cafe just outside of the main square. And sitting here sipping coffee is one of the most relaxing things to do in Salento Colombia. Not only are they serving up amazing local coffee. Their selection of cakes and sandwiches are to die for. My pick would be the brownie served with ice-cream and slathered with a thick layer of coffee flavoured arequipe (A Colombian version of dulche-de-leche). How To Get To Jesus Martin Salento: Jesus Martin is located on Cra. 6 #6 -2-minute minute walk from the main plaza. Quick Facts: Cost: $4,000 COP+ | Time Needed: As long as you like | Verdict: You probably decided to travel Salento because you love coffee. Therefore it’s definitely worth stopping in for a quick cup. Checking out the dried coffee beans before roasting on our coffee tour Salento Colombia. 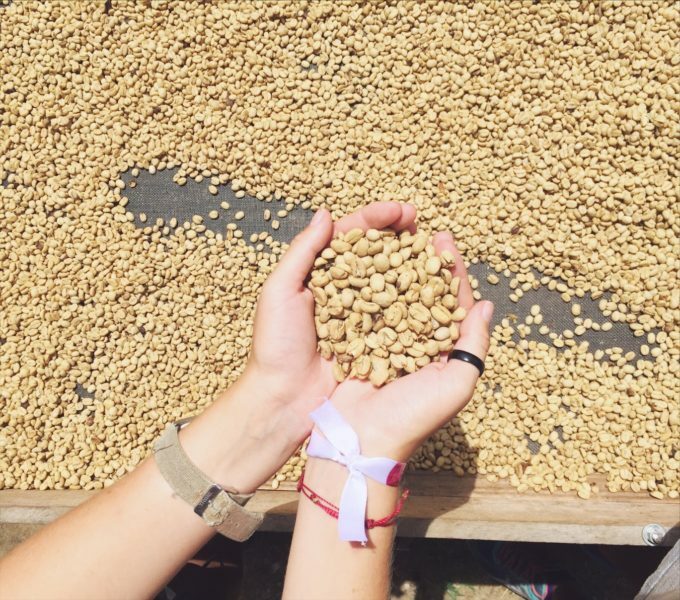 You can’t go to the best coffee region in the world without stopping in to see the incredible hard work and effort that goes into making it. We took a lovely tour with Las Acacias Coffee Farm Salento and learned the process from growing the coffee trees to drying the beans. All polished off with a delicious complementary espresso tasting. Make sure you try the awesome cakes they have on sale too. Muy rico! How To Get To Las Acacias Salento: Take the road out-of-town that heads towards La Serrana Hostel. When you reach the last fork in the road. 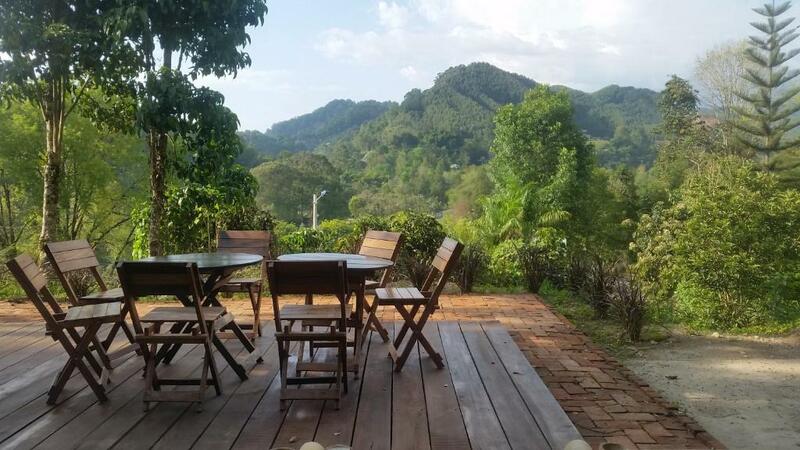 Take the right hand side and keep walking until you come to the coffee farm, which is opposite a beautiful mirador. Quick Facts: Cost: $6,000 COP for the tour. | Time needed: 2 hours | Verdict: This is one of the best coffee tours in Salento Colombia. Highly recommend if you’re a coffee drinker. Sometimes when travelling you just need a really good burger…. Amiright!? Well add Brunch Cafe to your Salento Travel bucket list and you won’t be disappointed. With delicious American style food and super generous portions, I ate here almost once a day. The peanut butter brownie is their signature dish and a must-try. And they even make huge lunch packs for any hikes you might do in the area. It’s definitely one of the top Salento Colombia restaurants. How To Get To Brunch Cafe Salento Colombia: Brunch Cafe is locate on Calle 6 No. 3-25. It’s a 2 minute walk from the plaza. Quick Facts: Cost: $15,000+ | Time needed: As long as you like. | Verdict: One of the best restaurants in Salento Colombia. Definitely worth hitting up if you’re in need of a Gringo food fix. One of the most unusual things to do in Salento Colombia is heading to the local pub – Los Amigos Salento for a game of Tejo. Colombia’s answer to exploding snap. It’s pretty similar to lawn bowls only you’re throwing a smooth rock at a pile of gunpowder that explodes when you hit it. Intrigued? I highly recommend you check it out. How To Get To Los Amigos Salento: Los Amigos is a little further from the plaza. A 5 minute walk max. Located in Cra. 6 #6/21. Quick Facts: Cost: $5,000 for a game plus a compulsory beer for $3,000. | Time needed: 2 hours. | Verdict: Playing tejo is a must-try when visiting Colombia. One of the super cool vintage Jeeps in the town square. A ride in these is one of the top Salento things to do. There are no taxis in Salento. Instead, all travel is done packed into old school vintage Jeep. And when I say packed in, I mean it. We managed to fit 12 people in one with a few people hanging off the back. Getting There: Head to the main square look for the spot where all the Jeeps park. Quick Facts: Cost: $3,800 COP per person per trip. | Time needed: As long as you like. | Verdict: If you need to take a taxi somewhere, why not make it a colourful Jeep? Just above the town square are a couple of miradors that overlook both the Cócora Valley Salento and the town. And while they aren’t stunning a walk to both of these is still one of the most lovely things to do in Salento Colombia. How To Get To Salento’s Miradors: If you head to the plaza and look at the surrounding area you’ll see some colourful stairs. Walk up the stairs and you’ll reach the first mirador looking over the town. Then follow the path to the left for five minutes where you’ll find the second mirador. Quick Facts: Cost: Free | Time needed: 2 hours. | Verdict: It’s a nice Salento Colombia activity if you have some spare time. When I was investigating what to do in Salento Colombia I was surprised to learn that eating trout was on almost every list. It wasn’t until I headed to the mean square to try the trucha con patacon – the signature dish of perfectly cooked trout baked in a creamy, garlicky sauce and topped with lots of cheese that I realised why it was a must-try. It’s bloody delicious! How To Get To The Trout Restaurants: Head to the main square and look for a spot that’s full of locals. Quick Facts: Cost: $15,000+ COP | Time needed: An hour or so. | Verdict: Trucha Con Patacon is a must-try while in Salento Colombia. The delicious Limonada De Coco. A drink you’ll only find in Colombia. Drinking one of these at the Mirador was one of my favourite Salento activities. We had heard about Limonada De Coco from a few people while traveling Salento Colombia but hadn’t thought too much of it. It wasn’t until we visited the miradors and saw a few sellers that we gave it a try and haven’t looked back. The tangy flavour of the lime mixed with the creamy coconut milk and ice makes for an incredibly refreshing and delicious beverage. How To Get To The Best Limonada De Coco Stand: The best Limonada De Coco can be found at the small seller near the Cocora Valley mirador. Quick Facts: Cost: $6,000 COP | Time needed: As long as you like. 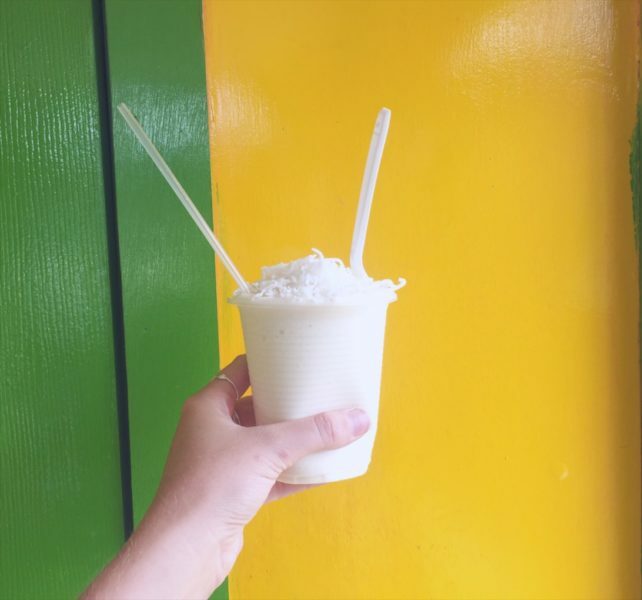 | Verdict: This was the best Limonada De Coco I tried in Colombia, and one of the best things to do in Salento Colombia. 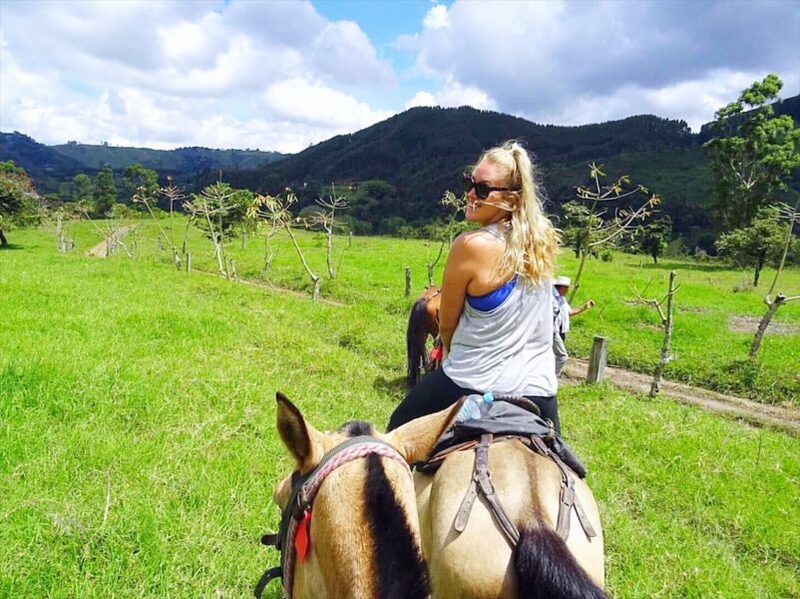 The Awesome views on our horse-ride, one of my favourite things to do in Salento Colombia. Over the course of this trip, I’ve realised I’m a sucker for horses. And lucky for me, horse-riding is one of the best things to do in Salento Colombia. We booked our tour through La Serana Hostel ($55,000 cop per person) and spent a lovely three hours trotting around the fields and forests of Salento. Finishing with a pretty view of one of the waterfalls. Our horses were calm and healthy albeit a little lazy, and the ride traversed rivers, mud and steep hills. Horse riding in Salento is truly magical. Getting there: Your guide will collect you from your hostel. Quick Facts: Cost: $55,000 COP so about $18 USD. | Time needed: Half day. | Verdict: Must-do if you enjoy riding. 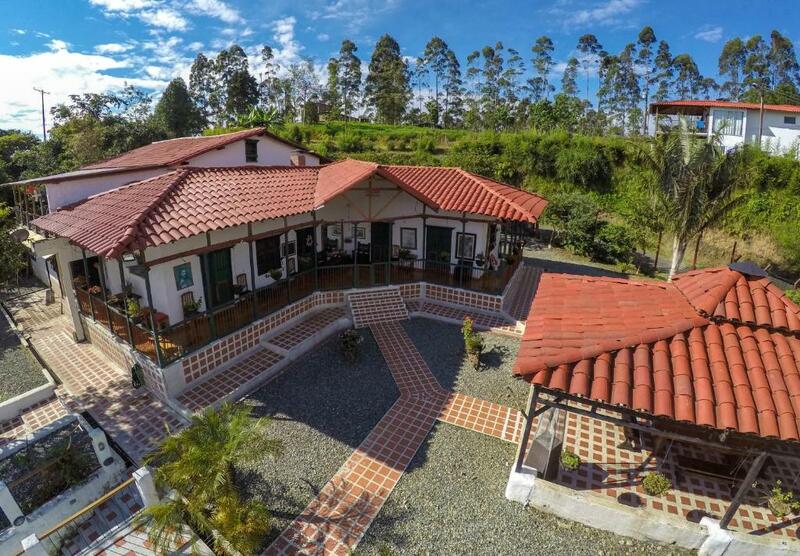 There are a tonne of fantastic places to stay in Salento Colombia. 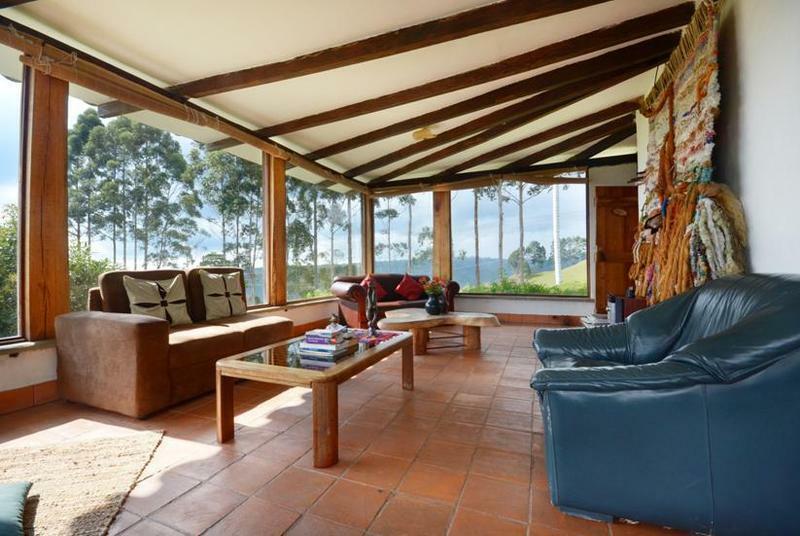 From stunning Salento Colombia hotels to fun and social Salento hostels. Here are my top picks of where to stay in Salento Colombia. La Serrana Hostel Salento is one of the nicest hostels I’ve stayed in. Super social with a generous breakfast, family dinners and stunning views of Salento. With free breakfast, table tennis, billiards and darts this is a great Salento Colombia hostel. WIth lovely staff and owners it’s a 20 minute walk from the centre of town. Located in the countryside the bed and breakfast has a pool, warm owners, free breakfast with fresh milk from the cows every morning. One of the nicest hotels in Salento Colombia. It has a stunning view, free breakfast, giant hammock and a hot tub. Very romantic! Depending on where you’re coming from there are a number of ways to get to Salento Colombia. If you’re heading from Medellin to Salento the easiest way is definitely to take a direct bus with Flota Occidental. They leave every day at 9 am, 11 am and 1 pm from the Medellin bus station. It costs 45,000 pesos (around $16 USD) for the 7-hour journey. If you don’t want to take the direct bus you can always take the bus to Armenia and then catch another bus from Armenia to Salento. But it ends up costing around the same and taking more time. There is no Medellin to Salento night bus, which is a bit of a bummer. But at least the scenery on the way is quite nice. There are a few options for getting to Salento from Bogota, these are listed below. The cheapest way to get to Salento from Bogota is definitely by bus. Head to the Terminal de Transporte and take the next bus to either Armenia or Pereira. From here you can take a 2nd bus to Salento. This journey will take you around 8 – 10 hours all up and will cost around $65,000 COP (Around $23 USD). A much quicker way to get from Bogota to Salento is to fly with Viva Colombia to Pereira and then take a bus. The journey will take around 2-3 hours. With the flight taking an hour and the bus then taking another hour. Flights are really cheap in Colombia so the prices may not end up being too much more than the bus. You can check flights with Viva Colombia here. Cali is around 4 hours from Salento so the best way to get to Salento from Cali is to take a bus. Unfortunately, there are no direct buses, so you need to take the bus to Armenia and change. The bus from Cali to Armenia takes around 3 hours and will cost $20,000 COP (around $7 USD). The bus from Armenia to Salento takes about an hour and costs $4,800 COP (around $2 USD). They leave pretty much every hour from the Armenia bus station. 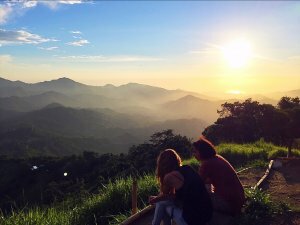 It’s pretty easy to scrimp while you’re here as most of the top things to do in Salento Colombia are really cheap or free. I would budget for around $30 – $35 USD per day which would cover you for $10 accommodation, $15 for food and $10 for activities. Done All The Things To Do In Salento Colombia And Want More? Check These Out! 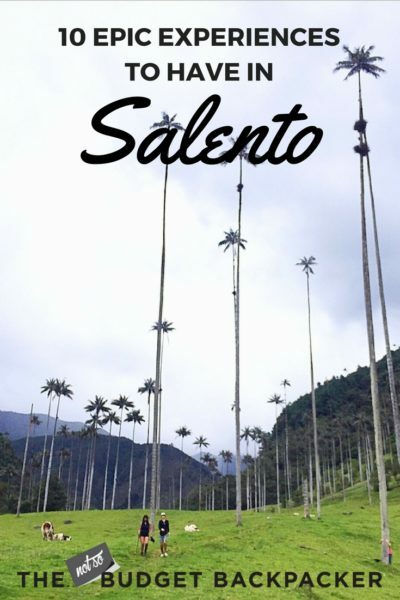 There are links within this post on the best things to do in Salento Colombia that I can earn a commission on, which allows me to keep providing free travel tips and destination guides. If you’re thinking about purchasing something I have recommended I’d really appreciate it if you bought it through this site. All opinions as always remain my own. Thanks for such a helpful post! My husband and I are going to Salento next month and you just laid out a ton of stuff for us to do! 🙂 Looking forward to reading more of your posts! So glad you liked it. You’ll really enjoy Salento. it’s beautiful! !